A revolution in achieving complete, whole body nourishment with the power of advanced food fermentation and the alkalizing and energizing benefits of greens+ O! 100% vegan, gluten-free, dairy-free, soy-free and made with non-GMO ingredients, greens+ whole body NUTRITION harnesses the power of supercharged whole food ingredients and fermentation to optimize key body systems - nourishing and balancing your whole body! Did you know the fermentation process removes anti-nutrients in plant-based foods? Learn more about fermentation advantages on our blog, The Well. greens+ whole body NUTRITION is 100% vegan, gluten-free, dairy-free, soy-free and made with non-GMO ingredients. The link between diet and disease is well established. It’s all too easy to be overfed on highly processed foods and undernourished due to lack of vitamins, minerals and other nutrients that fresh, whole foods contain. But while good nutrition is crucial in defining our health – there is more to nourishment than what we eat! It all starts in our gut, where trillions of bacteria live that are essential for optimal health. The health of your gut defines how your body utilizes the food you nourish it with. greens+ whole body NUTRITION was formulated to change the way people are nourished, by feeding the body and the multitude of healthy bacteria that resides within, defining our capacity to absorb and utilize nutrients, bolster our defenses and balance our bodily systems. Changing the way you are nourished is easier than you think: consume fermented foods + avoid common allergens + nourish the body with a wide variety of colourful whole foods that are alkalizing, antioxidant rich and anti-inflammatory! By combining carefully selected ingredients that are proven to nourish, boost and balance key systems in our body supports complete, optimal health and amplifies them with the power of artisanal fermentation techniques. This encourages healthy gut flora and fuels the body with alkaline ingredients, potent anti-inflammatory foods, and free-radical quenching antioxidants. Non-Medicinal Ingredients: Stevia rebaudiana: organic stevia leaf & stevia leaf extract, natural flavour, tricalcium phosphate, ascorbyl palmitate, maltodextrin, silicon dioxide. Adult Dosage: Mix 1-2 scoops (16.2-32.4 g) of greens+ in 1-1.5 cups (250-375 mL) of pure water or juice. Shake well. If you are a new user of greens+ begin with 1 scoop daily and gradually increase to 2 scoops daily over a 3 week period. Take 2 hours before or after other medications. Note: greens+ Whole Body contains no gluten, wheat, dairy, egg, soy, yeast, animal products, artificial colours, flavours, sweeteners or preservatives. 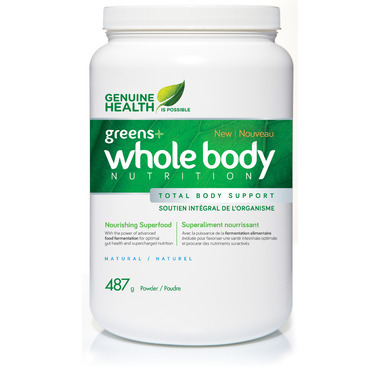 Genuine Health Greens+ Whole Body Nutrition is an exceptional product. When taken daily it helps alleviate inflammation of all kinds in the body, from digestive health to joint health. It also gives you an energy boost so you get all you need done in the day - and the extra vitality can boost mood as well.